Super Collagen + C, the dietary supplement has collagen peptide type 1 and type 3. It braces the collagen available in hairs, nails, skin, ligaments, muscles and tendons. Collagens are the key component which keeps the bones firm and healthy. By regular supplementation of super collagen + C, you can have regular blood circulation, stronger bones, healthier nails, nourished hairs, glowing skin, better calcium absorption and much more. It encourages the speedy recovery of bones and muscles. Good health is the beauty so keep your body healthy with this Amazon Neocell Super Collagen+C in Pakistan. It is recommended to take 6 tablets in a day for better and quick result. Keep it away from the reach of children. You can have 6000mg of collagen in one serving which works effectively. It can make the skin younger looking, smooth, soft and radiant as it keeps the skin hydrated. 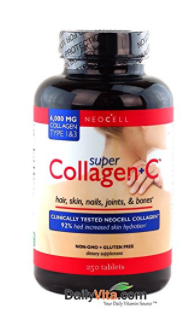 Find Neocell Super Collagen+C price in Pakistan and buy them from Amazon online shopping in Pakistan. You can get the Amazon products in Pakistan with the cash on delivery facility. Amazon Pakistan will deliver the product at your doorstep in the best delivery time and make you feel satisfied with the service.